How to Sell Silver Bullion Online? To sell your silver bullion online is about as easy a process as being able to buy silver online. Yet there are some additional steps and processes to understand for silver selling safety and success. Here we cover some Do’s and Don'ts, including some sell silver online best practices. Learn how to safely ship silver bullion in the USA, as well as how to yield the best prices and find trustworthy counterparties to sell silver to. You can always find many of the prices we offer live when you want to sell silver bullion. Sell Silver Online: How To’s? For the vast majority of the US population living near large urban city centers (about 70% of us), you will likely be able to find various options (both online and somewhat local) when it comes time for you to sell silver (if you ever decide to). When selling silver online, especially large lots of silver bullion, trusted online bullion dealers are likely the safest and best method to receive the best combination between highest price possible and safety for your online silver selling. One of the best hard to rig bullion dealer review websites is Gold Dealer Reviews. Before ever risking any of you capital with just any silver dealer, make sure their latest customer reviews are high and that the particular business is delivering on agreements made with their customers (sadly, many do not). When selling small lots of bullion (less than $1k USD) trusted local bullion dealers in city centers may be the best, fastest option given the speed of payment and lack of shipping fees associated with such a quick, same day sale. The downside on local silver selling is you will likely yield less fiat currency in payment than you might if you sell silver online to a bullion dealer like us at SD Bullion. For selling silver to online silver bullion dealers, the process generally involves a phone call, with an explicit description of the exact product(s) you are seeking to sell. Most silver bullion dealers will be able to give you an immediate bid price offer on the silver bullion products you are selling over phone (even in online chats sometimes). If you have already shopped around, and this silver sell price and process works, most often you can ‘lock in’ that silver bid price with a credit or debit card for collateral reasons (in case for some reason you don’t deliver the silver bullion you are selling, check the details according to the online silver bullion dealer’s policy). 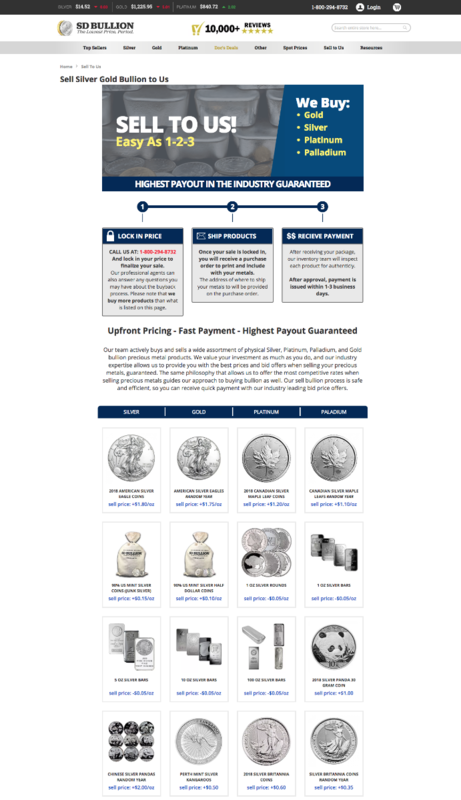 Sell Silver Bullion Online: Fully Insured Shipping Process? Before shipping your silver bullion products, be certain to document (take photographs) of all the contents of the package before sealing the parcel. Yes, this means actually taking pictures or video of all the silver bullion products and specific packing slip documents you are putting into the parcel. You want to do this in case of the very small chance someone steals and or breaks into the parcel in route to its destination. Or perhaps there is some discrepancy upon delivery by the silver bullion dealer you are selling and shipping to. Now let us discuss the most safe, fully insurable method to ship bullion parcels domestically in the USA. For individuals (not using 3rd party logistics professionals + insurance policies) never use FedEx, UPS, DHL, or other private parcel delivery services to ship bullion within the USA. All these aforementioned private shippers explicitly prohibit precious metals and thus silver bullion from being shipped in their terms of service (e.g. 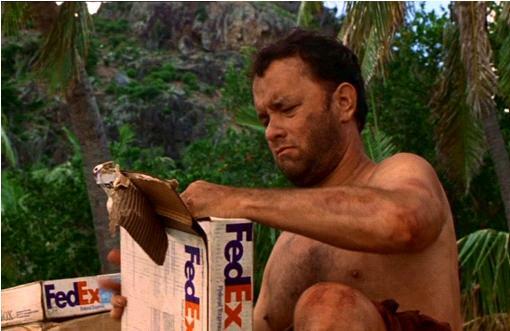 FedEx, UPS, DHL... use your computer’s find command to search and you can find either ‘precious metals’ or ‘bullion’ restrictions in each respective terms of service document backlinked). How do you Safely Ship your Sold Silver Bullion? When shipping silver bullion in the mail within the USA, the USPS Registered Mail service remains the best general shipment option in terms of overall price, safety, value, and potential insurance coverage. Have a filled out USPS Form 3806 before engaging a USPS agent in person. You can get one for free at your local USPS shipping location. Use a minimum of 2 boxes, one smaller inside to contain and protect the silver bullion packed within, another Priority Mail box for the parcel’s exterior. Notice for example how heavily packaged this small silver bullion parcel was from us to the customer. We suggest you mimic this methodology likewise but using USPS Registered Mail services. Ensure a lack of silver bullion content jingling by putting packed paper or styrofoam peanuts inside each silver round or silver coin tube’s top before securely taping them shut and against the interior box. For bullion bars, use tightly taped paper coverings or bubble wrapping between bars for secure silence. To ensure bullion round or coin tube tops stay shut, apply robust filament tape to secure each tube top remains closed in transit. All box USPS Registered Mail parcels should have 3″ wide gummed paper tape covering all corners of the outer box to ensure a tamper proof stamped seal on the outer edges of the parcel. As mentioned, most private shipment service providers like FedEx, DHL, and UPS explicitly prohibit individuals (not bullion businesses with direct operation agreements) from insuring precious metal bullion shipments. The main reason is due to potential theft. USPS employees who are caught stealing Registered Mail parcels typically end up in Federal Prison and also forfeit their often coveted pension plans. The US Postal Inspection Service even helps ensure that USPS Registered Mail will likely remain the safest best option for individuals shipping silver bullion fully insured through the domestic mail system. Most online silver bullion dealers offer payments to individuals selling silver bullion to them via either mailed bank checks, bank wire transfers, even ACH. The payment options given by silver bullion dealers are typically dependant upon the size of silver bullion you sell to them. The entire process from price ‘lock-in’, safe fully insured silver bullion shipping, secure silver bullion delivery, and final payment can be less than one week to a few weeks depending on logistics and market demand volumes. 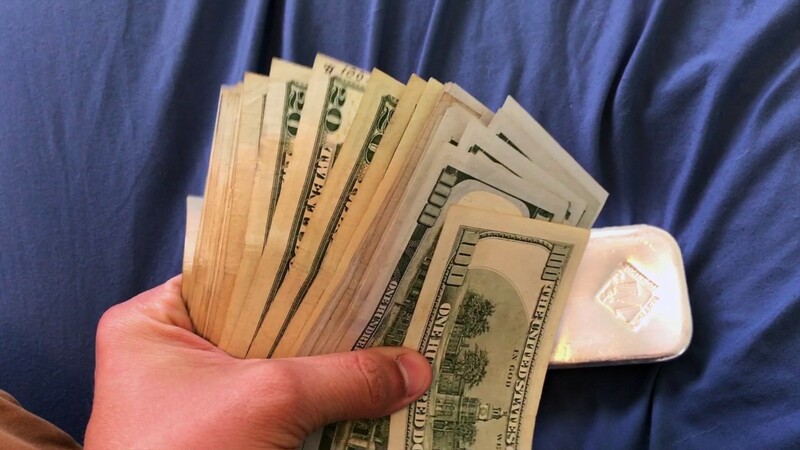 Do not simply take the first offer you get when you are looking to sell bullion. Don’t sell your bullion to any dealer without performing proper due diligence on their business practices and organic customer reviews. Try using 3rd party review websites and bullion forums ( reddit / facebook ) to hear and read as many new and mostly unbiased customer experiences as possible (many online silver bullion dealers monitor these forums as well, caveat emptor). Do not accept checks from any individual buyers as a bank check can be rescinded or cancelled only a few days after you have given your bullion to the buyer (potential fraud here is rampant). Do not simply sell based on the highest bid price, consider safety and the business track record of the potential counterparty you may be selling to. Do shop around for the best bid prices for the bullion products you are selling. Do your research between both local and online bullion dealer bid prices. Do consider selling highly collectible bullion items on eBay but be sure to note that as of 2017, eBay takes 10% or up to a maximum $750 USD of current bullion sales. Hence for example on a $10k bullion sale, eBay would take $750 USD meaning you would get back $9,250 USD barring all other listing upgrade fees. Of course these fee policies could change at any time so check and confirm for yourself before engaging such a silver bullion selling option. Do consider packaging and fully insuring shipping costs to the location where your bullion is being shipped and safely delivered to when sold. Do consider, during high demand, high bullion price premium bullion market surges to sell some high premium bullion items you own and quickly convert the proceeds into lower premium bullion products (thus acquiring more troy ounces) or divert the funds into other, more undervalued asset classes at the time. Do consider that often many high volume bullion dealers may have published live bid prices for the products they are bidding to buy. Yet note also these live bid price posting bullion dealers may have hidden tiered volume bid prices or minimum buyback thresholds. This means if you are only selling a small amount of bullion, you may not receive the bid price they have actively published on their website. Always inquire about additional fees potentially hidden (restocking, even assay fees, etc.). If you are considering selling silver online (especially any silver bullion products you may own), please give our online silver bullion dealership a look. We have high customer reviews of our services and have successfully purchased millions of dollars of silver bullion from individual silver bullion owners since our company’s inception in 2012. We are a silver bullion industry leader, offering the highest buyback prices on the silver bullion products we sell. Please give our bullion team a call ( at 1.800.294.8732 ) to to discuss our current silver bullion buy back rates and procedures. For those selling silver bullion lots in large size, we can provide you with convenient professional silver shipping options as well. For more details on selling silver bullion to us here at SDBullion.com. Thank you for visiting us here at SD Bullion. If you are seriously considering selling silver bullion ⬅ click there or on the image below in order to get a live look at the various silver bullion product prices we are buying today. Do You Know The Fundamentals? How Much Does a Silver Dollar Weigh? How to buy Silver at Spot Price? Where Does Money Come From? Russian Coin Dealer INTERVIEW: Russia Gold Silver DeDollarization? What is a Silver Assay? How Much is a Ton of Gold worth? Does GOLD Rust, Tarnish, or Corrode? Bullion Sales Tax Return to Washington State? Jim Rogers - What if Gold Doesn't Pullback?